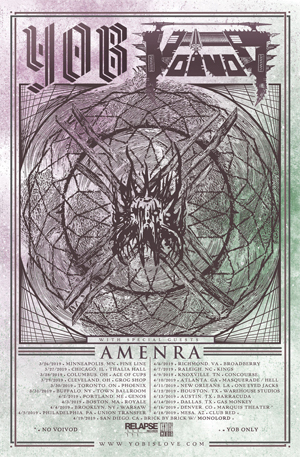 YOB, who have enjoyed a remarkable 2018, will return to the road next Spring, bringing VOIVOD and AMENRA along for the month-long trek across North America. Tickets, as well, as exclusive ticket and merch bundles, are on-sale now. The bundles, which can be found via www.yobislove.com/tour, includes an entry ticket, an exclusive t-shirt as well as the option of vinyl or CD versions of Our Raw Heart.